My Mobile Communication Final project is about the Sixpoint Brewery located in Brooklyn, New York. Sixpoint was officially founded in 2004, but according to the About page on their website, they claim that they were created "at the dawn of civilization" when man began to harvest grains. They believe their company today is the latest in the evolution of civilization. Sixpoint is a company that is passionate about producing quality craft beers and the social aspects that come with sharing a beer with family and friends. They look to live their motto "Beer is Culture" with everything they do from brewing their beer to hosting community clean-up events. The idea of Beer is Culture ties into the idea of the dawn of civilization. For culture to exist, the earliest humans had to survive by creating and maintaining a sustainable food supply. Among the items used for sustenance were fermented beverages, better known today as beer. Sixpoint looks to celebrate the accomplishments of mankind and celebrate the precious gift of life by bringing quality beer to the masses. Brooklyn used to be a prominent area for beer breweries, but by 1976, all of the breweries disappeared, along with a lot of the population in Brooklyn. When Sixpoint began its operations, they were part of Brooklyn's resurgence and renaissance that has grown significantly in the past decade. As an emerging cultural epicenter of new and old trends, Brooklyn is home to many young 20-30-year-olds who commute to Manhattan for work. Sixpoint has capitalized on this unique opportunity to really style themselves as one Brooklyn's best brands. Sixpoint has created a connection with their fans not only by hosting community events, but also by offering them ways to connect with them, namely through social media. Their typical consumer falls in the range of 20-30 years-old. This demographic is highly sought after, especially in Brooklyn that has several other breweries, including the famous Brooklyn Brewery, competing for the same audience. Sixpoint's efforts at positioning themselves as a great company both financially and morally are reflected through their growing popularity. The same things that Sixpoint cares about are the same things its consumers care about, namely great tasting beer and serving a higher purpose. But that begs the question, how does Sixpoint instill such brand loyalty? As a Sixpoint Brewery fan, the first thing that helps is that the beer they create and sell is fantastic! In addition, Sixpoint celebrates each of its beer lines. They make different beers based on the seasons, some beers have exotic ingredients, and some beers are made exclusively for just one restaurant! They are my #1 favorite brewery. I enjoy their beer so much that I pick it up whenever I can. Their social media engagement with their fans is superior to most brands I've encountered. They like my pictures on Instagram and respond to questions I post on Twitter and Facebook. It's fun to be a fan! The way they package and design their beer is eye-catching. They host several community events in the New York Metro area including their flagship event, Beer for Beasts. Also, this past summer, my brothers and I participated in an event cosponsored by Ben and Jerry's and Sixpoint. It was a park clean-up event which was a part of Ben and Jerry's "Community Build" campaign that was taking place in several major cities throughout the United States. The premise was focused on improving your own community and cherishing your home. The reward for participating was a cup of a special New York City themed flavor of Ben and Jerry's ice cream. All of the ingredients were voted upon by online voters. Every city had local companies vying to be included in their city's themed flavor. Sixpoint was one of the winners and thus had one of their beers added to the New York City flavor. It's obvious that I am a huge Sixpoint Brewery supporter. Sixpoint is a brand that produces quality products and has a philosophy of which their fans can be proud. But to create this image, the company has done a lot to make them stand out in the mobile digital world. Just how does Sixpoint gather new fans through social/mobile media. Sixpoint's involvement in the mobile communication world is diverse. They have several of the mobile mainstays including active social media pages. They are also experimenting in new endeavors such as UNTAPPD, a new social media platform specifically for beer. Sixpoint is always looking to talk with and engage their fans in various ways, and mobile communication is where their target market overwhelmingly resides. Untappd is a new social media platform that combines FourSquare and Instagram, but with a twist. The service is strictly for beers and bars. The site allows you to check into a bar and post what beer you're drinking. Users can attach a picture of the beer and even rate it for all to see. Users can also connect with friends and see where they have been and what beers they have tried. Sixpoint currently has over 21,000 likes on Untappd while there have been nearly 300,000 individual Sixpoint beer reviews by users. One unique thing that Sixpoint has done recently is launch a contest on Untaapd called "Toast with the Most." The contest was launched on November 15th and is concluding on December 23rd. Users are encouraged to take a picture of a toast featuring a Sixpoint beer (or beers) to celebrate the holiday season. Pictures are going to be judged by the creativity of the shot including the setting, the accompanying caption, and hits (comments, "likes," etc.). Winners will receive Sixpoint merchandise and one grand prize winner will receive a special New Years' Eve Toast from Sixpoint. Sixpoint is well entrenched in Facebook and Twitter. Both of these pages have over 35,000 fans apiece. The pages both produce original content and interact with fans. Facebook and Twitter are accessible through either a computer or a smartphone and are arguably the two most popular social media sites in the world. It is essential for most brands in this day and age to have a Facebook and/or Twitter page for fan involvement. It is here where Sixpoint can begin building brand loyalty with their fans. By talking to them and featuring their photos, fans develop a connection that runs deeper than just enjoying the beer Sixpont brews. Aside from Facebook and Twitter, Sixpoint is gaining momentum on Instagram. Instagram is a photo sharing social media site that was recently purchase by Facebook. Users are able to add photos just like Facebook, but they can also add effects such as filters and use a blurring tool to make a more compelling photo composition. Sixpoint often likes photos that have the account tagged in the picture or a #Sixpoint "hashtag." Sixpoint also has Pintrest and Youtube pages that are not as active as their three previously mentioned social media pages. On the bottom of each Sixpoint carton is a QR code that brings you to a mobile optimized webpage describing the beer and some of its stats such as ABV (Alcohol By Volume) and IBU (Interational Bittering Units). 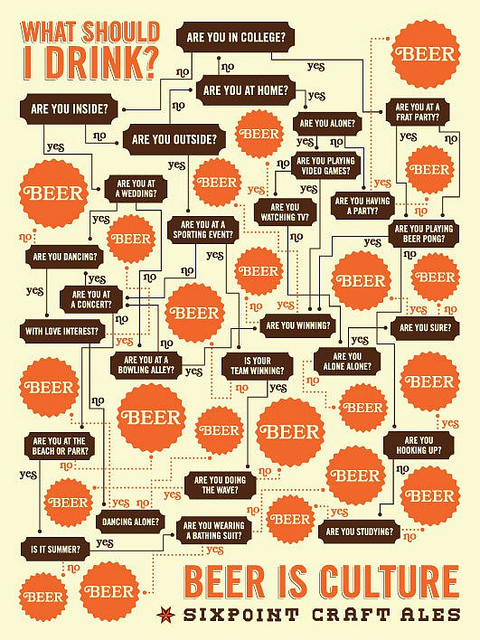 This is a quick way for consumers to learn more about the beer they have chosen.